A catalytic converter is an emissions control device that converts toxic pollutants in exhaust gas to less toxic pollutants by catalyzing a redox reaction (oxidation or reduction). Catalytic converters are used with internal combustion engines fuelled by either petrol (gasoline) or diesel—including lean-burn engines as well as kerosene heaters and stoves. The catalyst support or substrate. 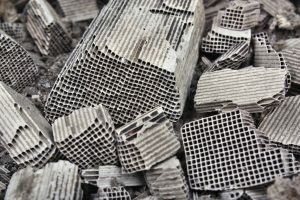 For automotive catalytic converters, the core is usually a ceramic monolith with a honeycomb structure. Metallic foil monoliths made of Kanthal (FeCrAl) are used in applications where particularly high heat resistance is required. The catalyst itself is most often a mix of precious metals. Platinum is the most active catalyst and is widely used, but is not suitable for all applications because of unwanted additional reactions and high cost. Palladium and rhodium are two other precious metals used. Rhodium is used as a reduction catalyst, palladium is used as an oxidation catalyst, and platinum is used both for reduction and oxidation. Upon failure, a catalytic converter can be recycled into scrap. At this point begins our job. The precious metals inside the converter, including platinum, palladium and rhodium, are extracted. Prices paid for catalytic converters vary depending on the type and market prices. In metallurgy, a non-ferrous metal is a metal which is not ferrous, including alloys, that does not contain iron in appreciable amounts. 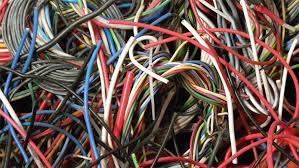 Important non-ferrous metals include aluminium, copper, lead, nickel, tin, titanium and zinc, and alloys such as brass. Exotic or rare metals such as cobalt, mercury, tungsten, beryllium, bismuth, cerium, cadmium, niobium, indium, gallium, germanium, lithium, selenium, tantalum, tellurium, vanadium, and zirconium are also non-ferrous. Due to its extensive use, non-ferrous scrap metal is usually recycled. The secondary materials in scrap are vital to the metallurgy industry, as the production of new metals often needs them. 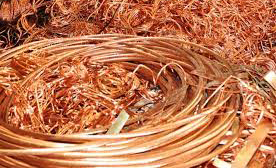 Non-ferrous scrap metals are sourced from industrial scrap materials, particle emissions and obsolete technology (for example, copper cables) scrap. 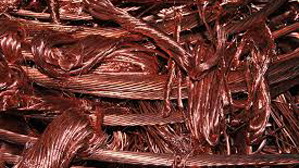 Prices paid for non ferrous metals vary depending on the type and market prices. Battery recycling of automotive batteries reduces the need for resources required for manufacture of new batteries, diverts toxic lead from landfills, and prevents risk of improper disposal. Once a lead acid battery ceases to hold a charge, it is deemed a used lead acid battery (ULAB), which is classified as hazardous waste under the Basel Convention. The 12-volt car battery is the most recycled product in the world, according to the United States Environmental Protection Agency. In the U.S. alone, about 100 million auto batteries a year are replaced, and 99 percent of them are turned in for recycling. About 97 per cent of the lead can be recovered. Pure Earth estimates that over 12 million third world people are affected by lead contamination from ULAB processing. If you decide to choose us, we will grade it and give you price for each unit separately. Or we can process all catalytic converters you bring, make analysis and tell you whole lot price. We can guarantee – you will be kindly surprised of our best prices on the market, flexible payment system, fast processing and our friendly team. That’s a promise!